JayWalk - All Your Xmms Are Belong To Me: Why Do I Feel Like I Kena Bruffed? As many are aware, I was in the US last week and during one of those days, I borrowed my aunt's car to go visit clients in LA. I pulled over at the gas (petrol) station to top up and the choices available to me were a surprise as the Octane level were merely 87, 89 and 91. Car can tahan meh? If I recall correctly, the "lousiest" petrol available in Singapore is Octane-92 which is even higher than the "best" in the USA. Here's what I don't get. All along I thought we were supposed to pump the higher grade petrol so that you have a better acceleration, cleaner burn, blah blah blah. The lowest Octane-92 were meant for certain types of Japanese cars whose engine are capable of accepting it. I even remembered where I was driving my Beemer, there was this sticker on the inside of the fuel door flap that says do not use petrol lower than Octane-95 or something to that effect. Cars in the USA different from Singapore meh? I probably think not. Then why is it that they have petrol with lower Octane number while we don't? We all know that petrol prices in Singapore is ridiculously high and I am not asking everybody to make a beeline for the lowest and cheapest Octane-87, if assuming it is available. Even if we pump the "best" Octane-91 grade, we should still be able to save quite a few dollars. No? So here's my question to the petrol companies. If the lower Octane fuel is suitable for cars in the US (I mean the Yanks do drive Benz, Ferraris, Beemers too, on top of the usual Nissans, Hondas and Toyotas), then why isn't it made available to us? Why shove the pricier fuel to us when we should have the choice to decide if we want to spend the extra dollar or not? Does the Gahmen have a hand in this? Anybody feels that same way? Pam: What are the Octane grades available in the UK? Ah, this one let Chem E. me explain. First, some background on octane numbers. There are two kind octane ratings in use throughout the world, RON (research octane number) and MON (motor octane number). Both characterize the anti-knock property of the fuel at low and high engine speeds respectively. The higher the number, the smoother it burns. Due to the different test conditions, RON values are usually about 8-10 higher in value than MON. In Singapore, the RON is displayed. 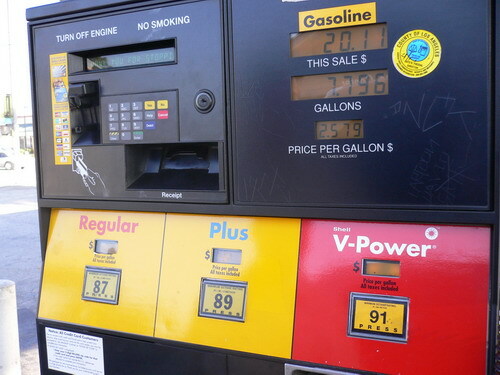 In the US/Canada, the PON (pump octane number) is employed instead. (PON=(RON+MON)/2). One will need to add about 5 to the PON to convert it to RON. For your example, the RON would be 92(87), 94(89) and 96(91), which is not far off from what is available in Singapore. Octane levels are higher in hotter climates in general for added safety and to compensate for the slight performance drop. This explains the apparent 'inferiority' of American fuel. Most cars on the market, other than top end late model German cars (e.g. BMW, Merc, Audi), do not benefit from fuel with RON greater than 95. Trust your owner's manual to tell you the appropriate fuel for your car. Anything betta is juz a waste of money. Paiseh JW for the super long comment. Vandice: Don't worry about comments being long. I appreciate the time and trouble you took to write it. It was most enlightening for a lay-man me to learn about RON, PON and MON. Sheesh.... if they all refer to the same bladdy thing, can't they just standardise and just use one? Nah beh... si beh confusing leh. Next question. When you said that there is no benefit from using a higher than necessary RON fuel, will there be damage if you use a lower than specified RON fuel? If so, how so? kIm: You catch ball with all these? Technically, yes. There is a suitable octane range for engine specific compression, ignition and fuel/air settings. In general, if you use a lower RON fuel, the engine will knock (i.e. perceptible rough running, not the more serious 'bang bang bang' violent shaking) and cause more wear and tear, as well as reduced performance. Not recommended unless you wanna save $$$ from fuel for major engine overhaul down the road. But most cars are able to run on 92-95 RON. er.. haha. not really. my brain's kind of rusted after a 8 months break. hahaha. kIm: Ok. Let me break this down to simpler bits. First off, vandice said that the Octane numbers between here and US are more or less the same. They appear different is because both sides used different units of measure. Secondly, Octane-95 fuel is good enough for most cars. No need to waste money going for the most expensive one. See? Tt's why you make a betta tutor than me. Vandice: You speak too soon. We haven't heard from kIm if she got catch my ball or not? Octane in UK - 95 and 97...i think... but our petrol prices are friggingly expensive. at the mo, it's standing at 88.9pence/litre (minimum) (that's x3 for you Singaporeans out there).....!!! ARGH. Pam: 88.9 pence (SGD 2.67) /l for which grade? What grade do you use for yourself? Perhaps on Vandice's advise you can switch it down to 95 (assuming you are using 97 now) to save some dosh each time? Folks Back Home: What is the current petrol prices in Singapore? How do we compare against UK? Hahaha. Yeah, I got it. Thank goodness I havent start driving yet. The octane no. are enough to mix me up. Haha. Anyway thanks for explaining!! Pam: I guess as time goes by under such high prices, everybody gets numbed by it eventually.